I flashed stage 2 last night on my ewg m135i and it's great! I changed the burble settings but have decided I don't like it, can anyone tell me what the standard settings are so I can go back. I think it's duration 0 sec and aggressiveness all the way to the left? I emailed Marshall and he said just flash back to Stage 2, which I have done, but I want to remove the cold start so need to use the map with options, but that remembers the last setting instead of standard... Anyone still using standard settings care to share what they are? I wish I had taken a screenshot now! And duration etc? So everything to the left= stock? I just checked mine but it's E-series not F-series. 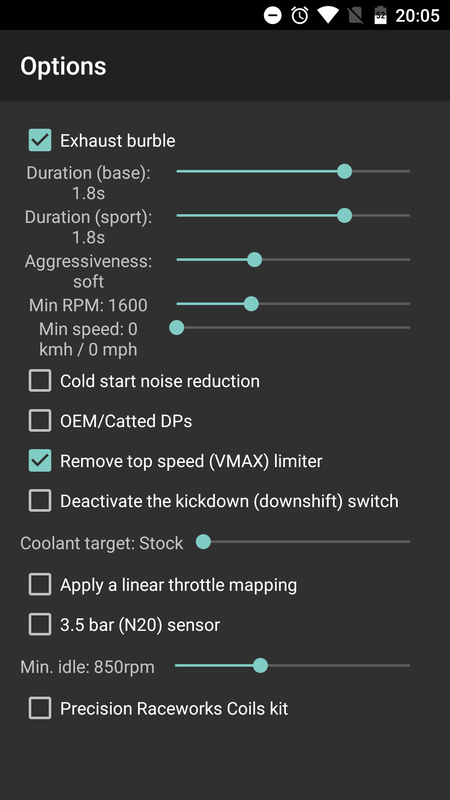 I have a slider for burble intensity and the far left is "OEM Style"
But there's also an exhaust burble checkbox, if you disable it, you lose all the sliders. So I think you would just uncheck that box if you have it. Thanks, mine is similar but without the linear throttle mapping and a few other settings. I'll try all to the left tomorrow, I'm fairly sure the stock durations weren't all to the left. Not sure if I'm doing something wrong but it seems even when I try to flash a normal stage 2 map it remembers the options and applies them regardless. I might return to map 0, uninstall the app and start fresh. You need to go into the write map options screen before flashing the map again. Uncheck burble option if you have it as a checkbox at the top like mine to disable.